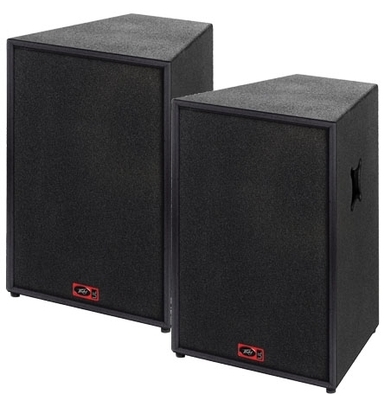 The PEAVEY UL 15 PASSIVE PA SPEAKER is a 2-way cabinet ideal for permanent installation, clubs, mobile discos and bands. Built in the UK from strong, lightweight poplar ply, finished in ‘Hammer Head’ polyurea coating and feauring Peavey’s Black Widow bass driver, the Peavey UL 15 is built for the most demanding professional applications. The Bi-amp ready crossover allows the UL 15 to be run with dedicated amplifiers for the treble and bass drivers making them highly efficient and focussed at high volume levels. With frequency response from 60hz to 17.5kHz and efficiency of 98db, this is a highly capable system. The PEAVEY UL15 is capable of handling a very healthy 500 Watts RMS and feautures a ‘Mid-range contour switch’ which allows you to scoop the mids for a smoother sound. The 22RX 1″ High Frequency compression driver is mounted on a 90° x 45° horn helping you to create a even, clear and detailed soundstage. The internal passive crossover features a protection circuit for the HF unit. 15'' (381mm) BlackWidow® woofer, cast frame with field-replaceable basket. RX™22 compression driver coupled with a CH-3 horn. Dispersion: 90° H x 45° V.
Frequency response: 60 Hz - 17.5 kHz. Three Neutrik® Speakon® connectors (one bi-amp and two for full-range operation). Full range and bi-amp operation with horn protection. Black Hammer Head™ polyurea coating. Reversible foam/metal grille allowing 2 different facias.